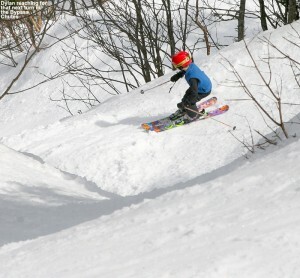 Ty out in the Bypass Chutes during today’s spring adventures at Stowe. 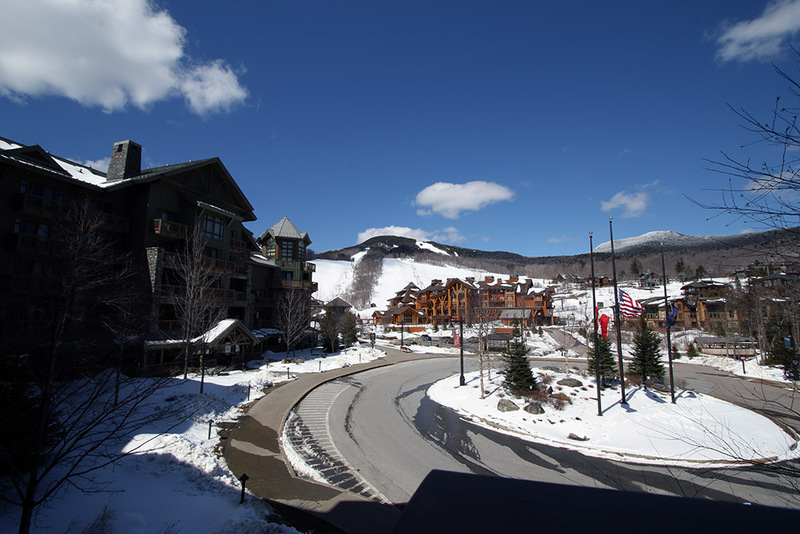 Based on the forecast, it looked like today was the pick of the weekend for spring skiing, offering sunshine and mountain temperatures in the 40s and 50s F depending on elevation. There was also a good freeze overnight last night, with temperatures down in the 20s F here at the house, so that bode well with respect to continued corn cycling. Our thermometer out back struggled to get out of the 30s F for the first part of the morning, but once we got past 9:00 A.M. it was moving into the 40s F, and a check on the temperatures at Stowe revealed that they were hitting similar levels. 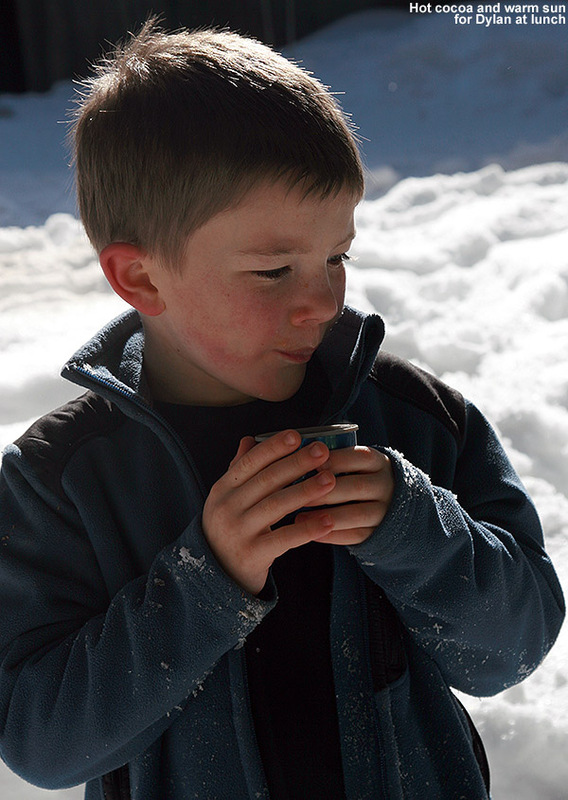 The snow had likely softened at all elevations by that point, so we headed off to the mountain. 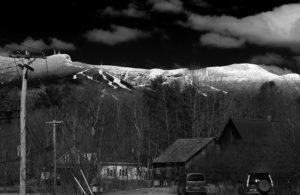 The lower mountain valleys around here in Northern Vermont have fairly patchy snow coverage now, and you have to get up into that 1,000’ to 1,500’ foot elevation range for really solid snow cover. 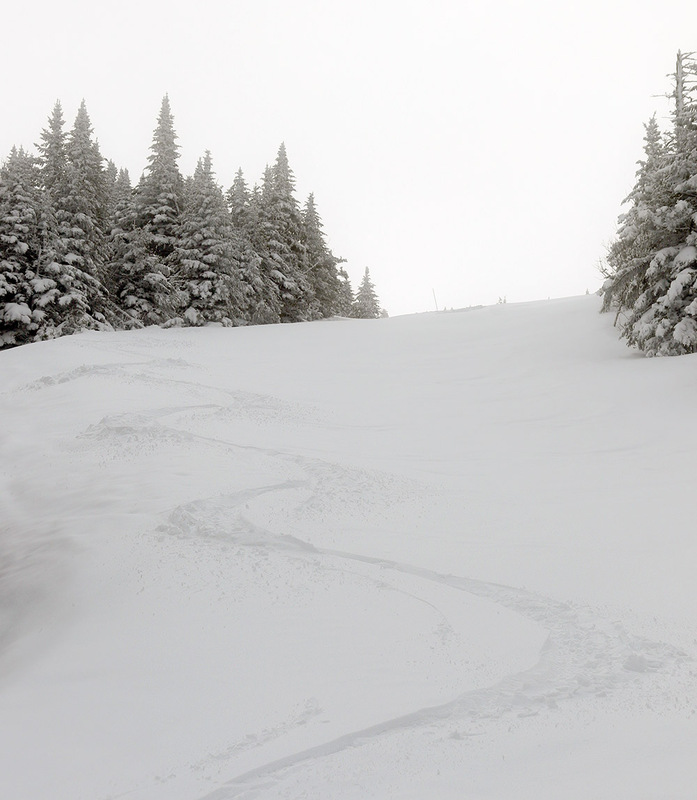 But once you get up into those elevations, the coverage is great; there’s about a foot and a half of natural snow down at Stowe’s base elevations, and the depth simply explodes upward the higher you go. Up around 3,700’ at the Mt. 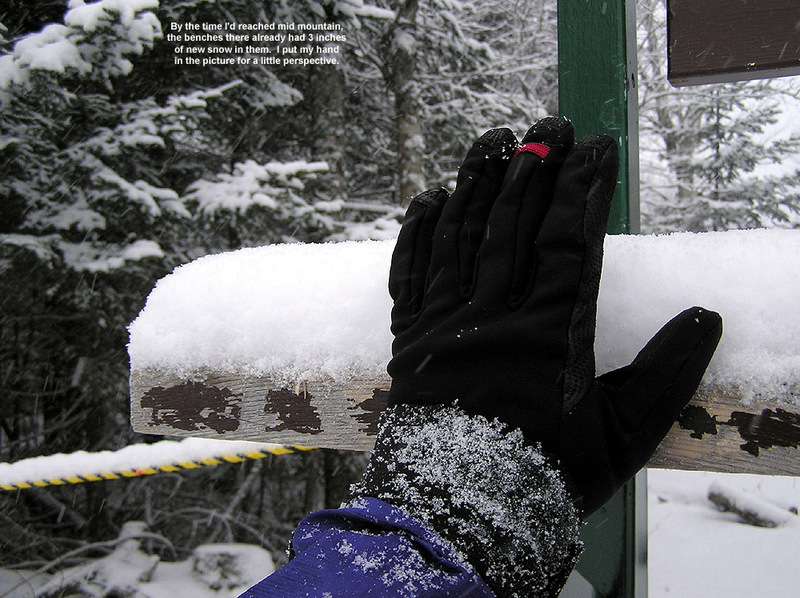 Mansfield Stake, the snowpack is in the six to seven foot range. 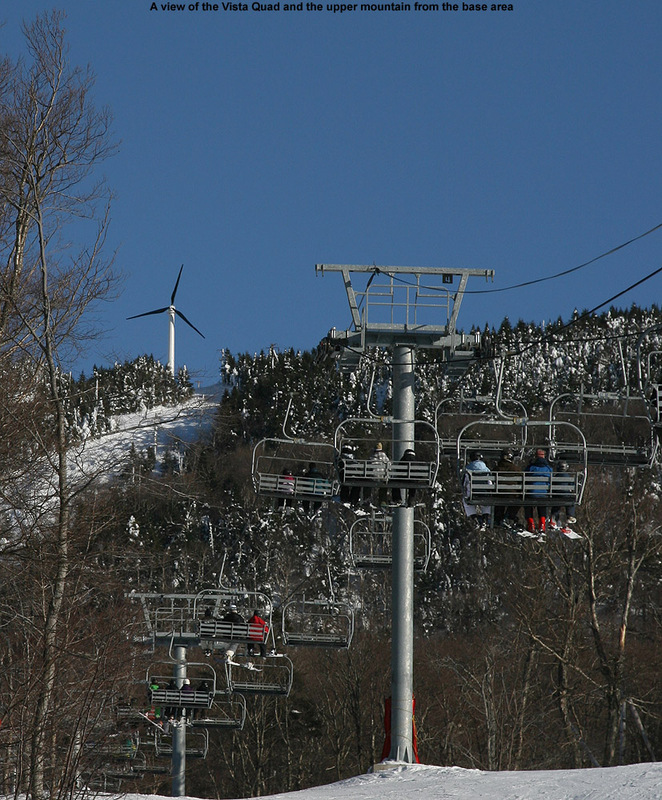 You can tell that coverage is great if you pan around at Stowe’s base area – even south-facing Spruce Peak is doing well. 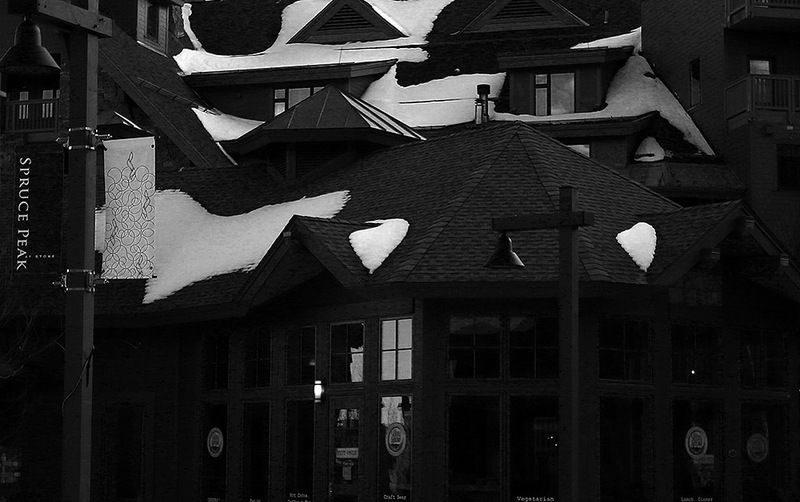 The morning snow report indicated that the Alpine Double would be running over at Spruce, but with the other lifts there closed down for the season, and the Gondola not running either, the Mansfield Base Lodge was really the most practice place to base yourself. 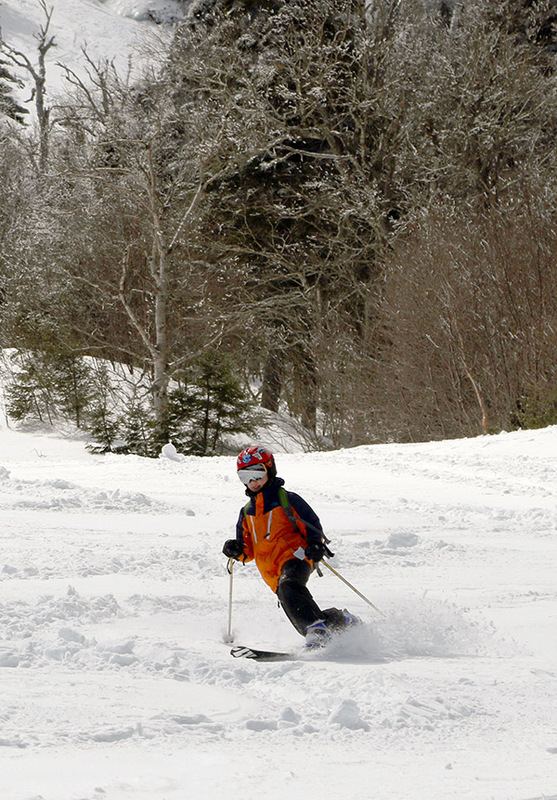 From top to bottom, snow coverage is really great out there on the hill right now. We suited up in the lodge and then I headed right up to the Stowe Toys Demo Center at the base of the Fourrunner Quad – I had a big day of checking out demo skis planned. 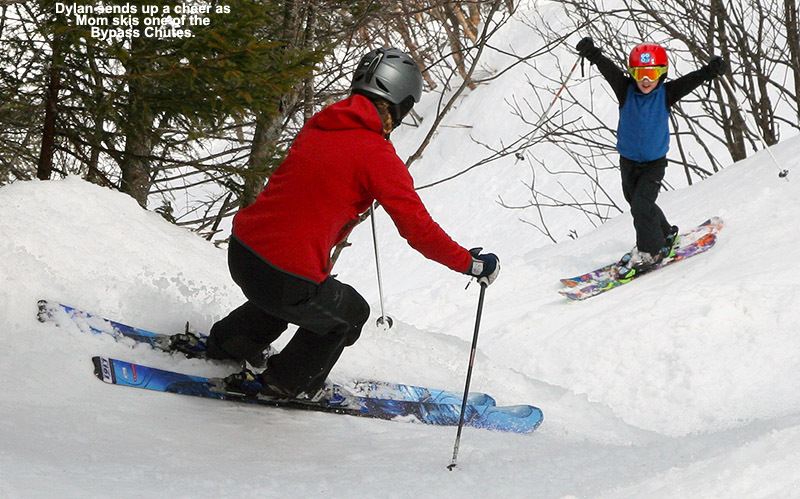 It’s hard to find a day to spend demoing skis, since many Sundays during the season we’re out at Stowe with the BJAMS ski program, we’ve got plans with other people on the mountain, or we’re hoping to head into the alpine terrain or out into the sidecountry for powder. 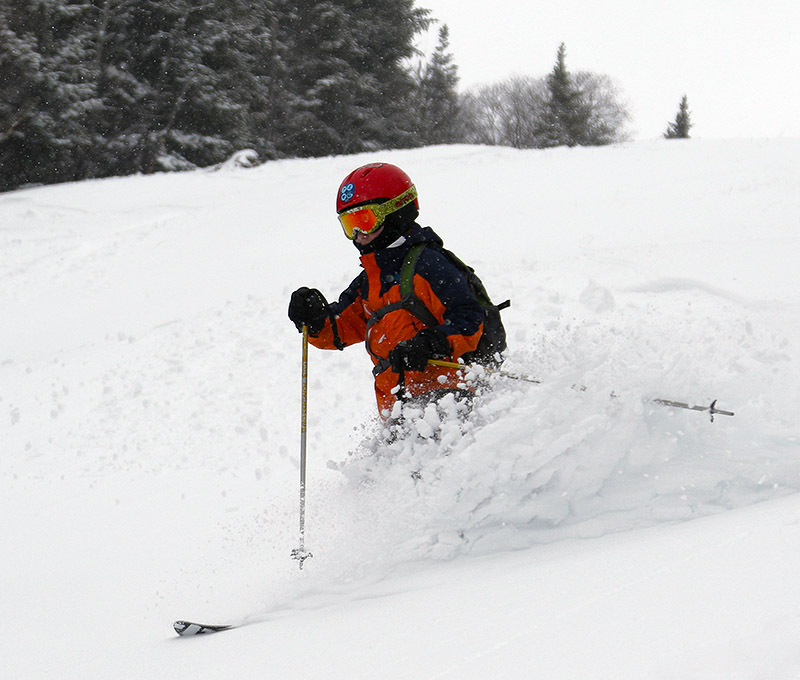 Our typical days with those types of focused runs aren’t conducive to swapping out skis every couple of laps on the lift. Today with E and the boys though, it going to be one of those casual spring outings with no real plans, and it looked demoing some pairs of skis would work. 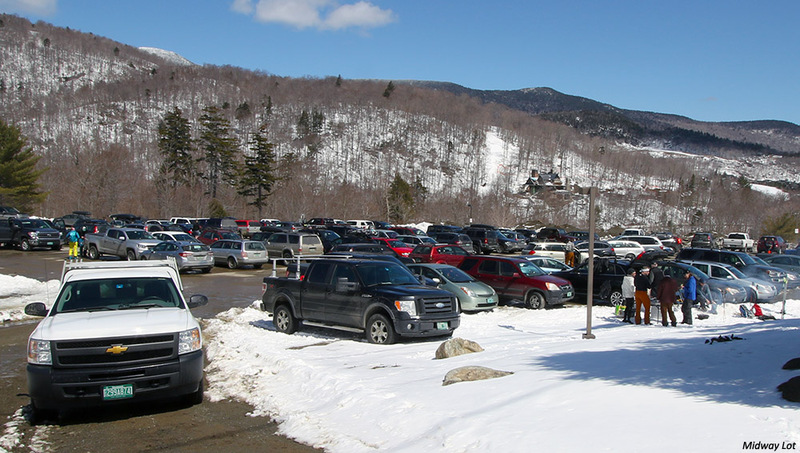 I’ve actually needed to do an alpine ski demo day for quite a while, but it really hit me a couple of seasons ago on February 26th, 2012 at Stowe. It was a bluebird day after they’d just picked up three feet of snow, so I pulled out my alpine fat skis for the day – my Volkl CMH Explosivs. They’re a fully-cambered, 120/95/112 ski from the early 2000s, and like many Volkl skis, they really like to go straight and fast. These Explosivs have always felt that way to me, especially with the length – I’d gotten them in the 180 cm length, since E had gone with the 165 cm version, and it seemed like a reasonable choice for me at the time. 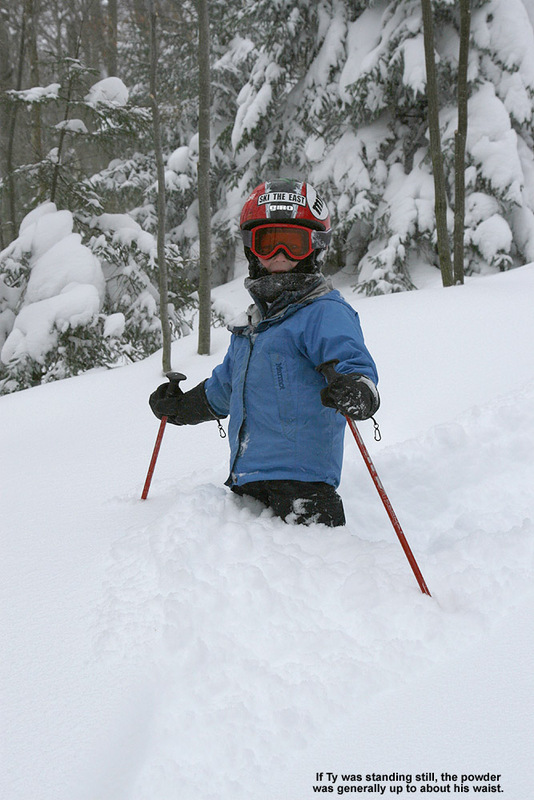 I hadn’t minded that they weren’t overly nimble, since powder can give you a lot of leeway, but it was always frustrating to have to deal with them in tighter trees, and they were essentially making that type of terrain undesirable and far less fun than it should be. 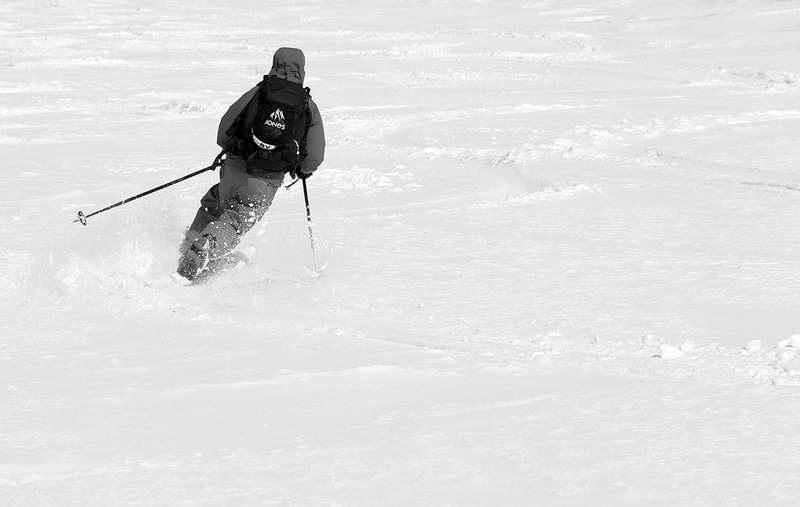 That powder day in February 2012 marked the first time I’d used the Explosivs in quite a while, and after spending so much time on shorter, much nimbler skis, their girth, length, and stiffness were oh so exceedingly apparent. While skiing Spruce Line that day, I went over a rise and dropped rather unexpectedly at high speed into the steepest pitch of the run. I wanted to check my speed, but the Explosivs just wouldn’t turn. I eventually had to bail into the snow to check my momentum, and the end result was happily unremarkable thanks to the slope being powdery and forgiving, but the skis had been feeling like heavy dogs on my feet all day, and that was definitely the last straw. I could easily see an accident arising due to the way those skis were handling. After that experience, I don’t think I’ve used them since, and my only alpine skis currently in use are my 108/70/101 Salomon Scream 10 Pilot Hots. They’re actually my on piste/carving skis, and they’re a joy to carve on, but that’s not really the type of skiing we spend much time doing. 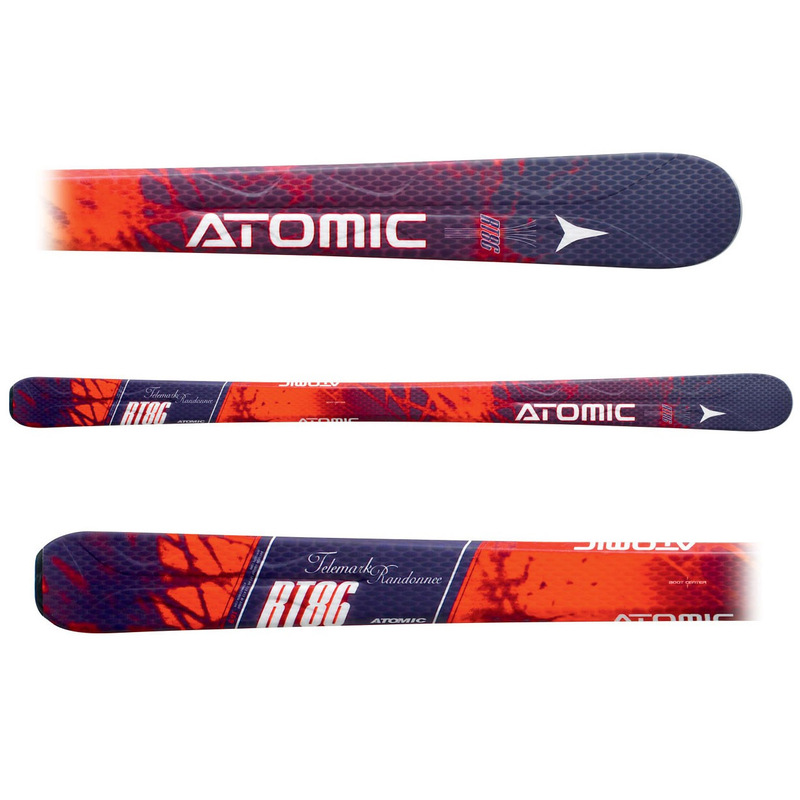 I’ve focused on my Telemark gear of the past few seasons, getting the cambered 127/86/113 Atomic RT-86 as my mid fat, and the more rockered 139/115/123 Black Diamond AMPerage as my powder/backcountry/fat ski. But, I’ve got nothing like either of those skis in my alpine gear, and alpine gear is what I’m typically on each Sunday when I’m coaching my BJAMS ski groups. Most of our ski days each season feature some form of powder, whether it’s on or off piste, and as I watch the boys drift and smear turns in the soft snow with their fat, rockered skis, I’m realizing that relative to the types of ski that are out there now, my Salomons are aren’t optimal for the kind of skiing we typically do. 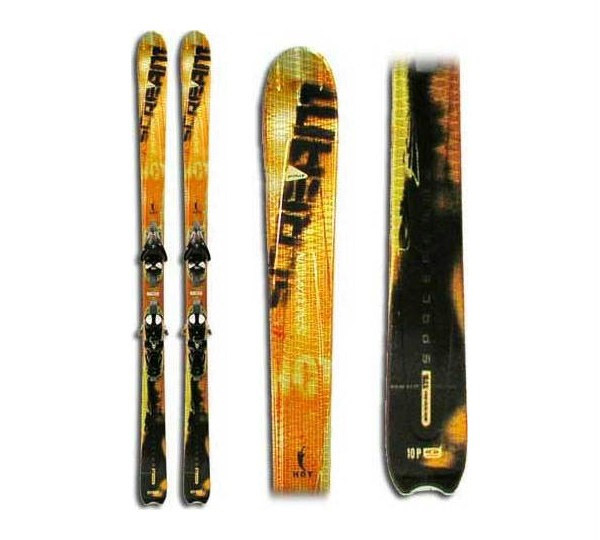 Based on my experiences with a wide range of ski widths in the past few seasons, and thinking about a typical everyday ski for the type of skiing that we actually do, something with a waist in the 95-100 mm range was my target. 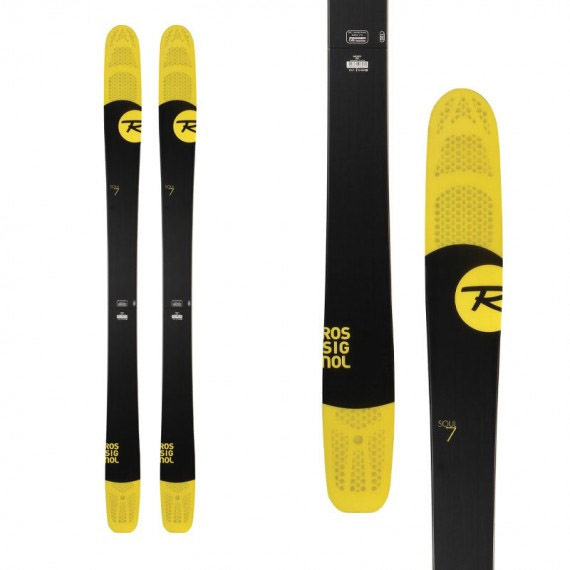 After seeing many of the latest gear reviews, it sounded like the Rossignol Soul 7 was really taking a lot of the top spots. It appeared to be my kind of ski with its light weight and ability to make short turns, so it definitely piqued my interest. At 136/106/126, it was a little on the wider side of what I’d been thinking, but it was close enough, and I don’t mind going a bit on the wider side for the type of skiing we typically do, especially if the ski was as versatile as everyone seems to feel it is. 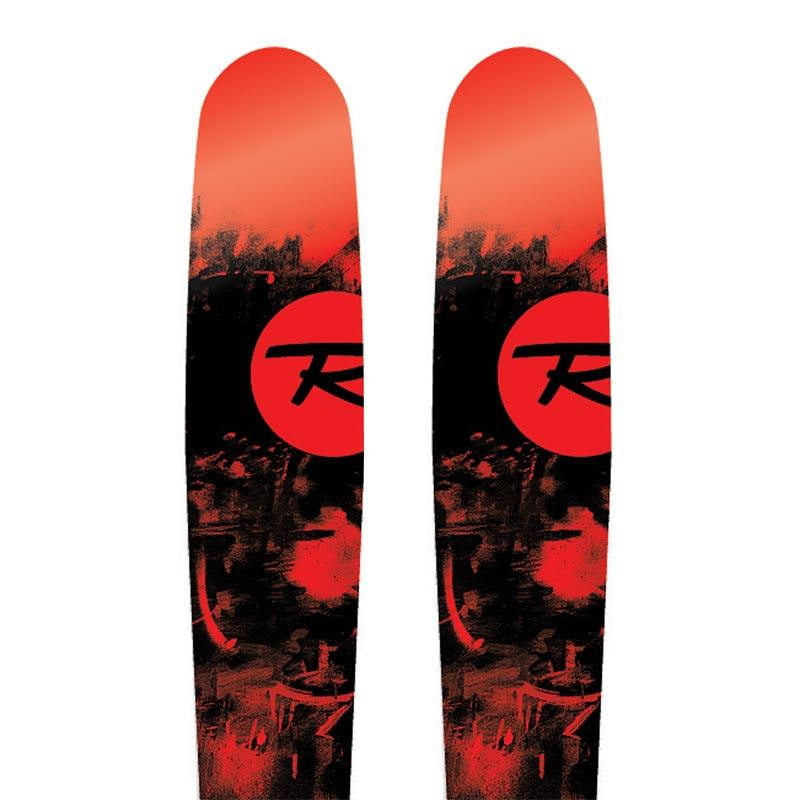 With that said, I also planned to check out the Rossignol Sin 7, since it was the next width down in the series at 128/98/118. Between those two, and a comparison to similar models from other manufacturers, I figured I’d have a good idea of what I liked. There’s a thing about demo gear though – the demo shops tend to sell it off. 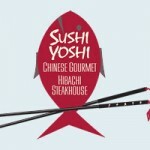 And this late in the season, that was a huge issue. It turned out that the demo shop had already sold all their Soul 7s, so those were entirely gone, and the only Sin 7 they had on hand was in a 180 cm length. 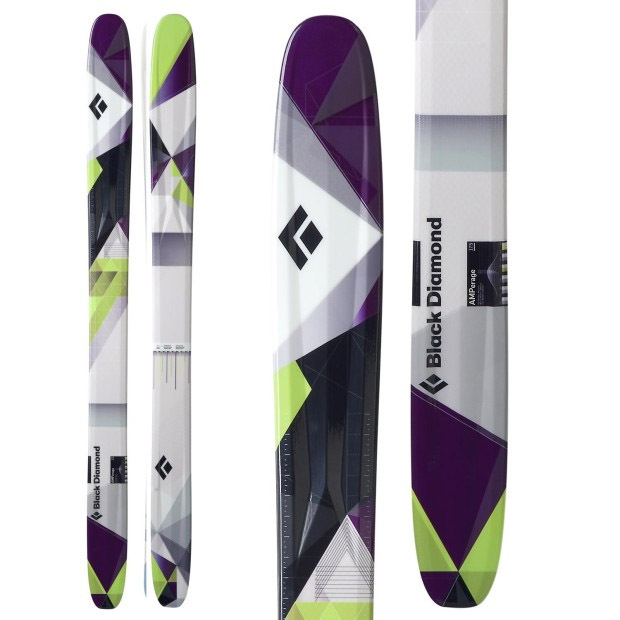 I had really wanted the 172 cm or 164 cm (I’ve got little interest in long skis at this point for the type of skiing we typically do), but if the 180 cm was the only option, it would at least let me get a feel for them. According to everything I’ve read, the Sin 7 does run short with all that rocker, so I was intrigued to see how they performed at 180 cm. 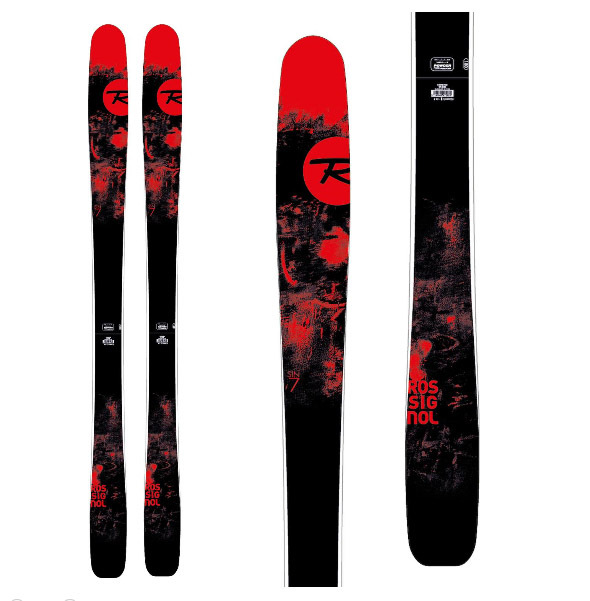 I also inquired about the next wider ski above the Soul 7 in Rossignol’s Freeride 7 series, the Rossignol Super 7. At 140/116/130, the profile is something more similar to my Black Diamond AMPerages that I have mounted Tele. Since I’ve already got my Salomons for carving, I’m leaning a bit on the wider side for the all around soft day ski that I’m seeking, and while the Super 7 is almost certainly wider than I want, I still wanted to try them out. 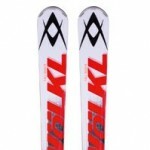 I wanted to have a feel for all their skis in that 95-115 mm range of width. I was surprised to find out that they shop didn’t even carry them, and the guy that was helping me out in the demo shop said it’s too wide a ski if you ski on the “East Coast”. I’m not sure if he’s just supposed to say that, whether he actually believes it, or if there’s some other reason he’s supposed to go with that philosophy, but it was probably the first sign that we weren’t going to be quite on the same page with respect to our viewpoints on skiing. 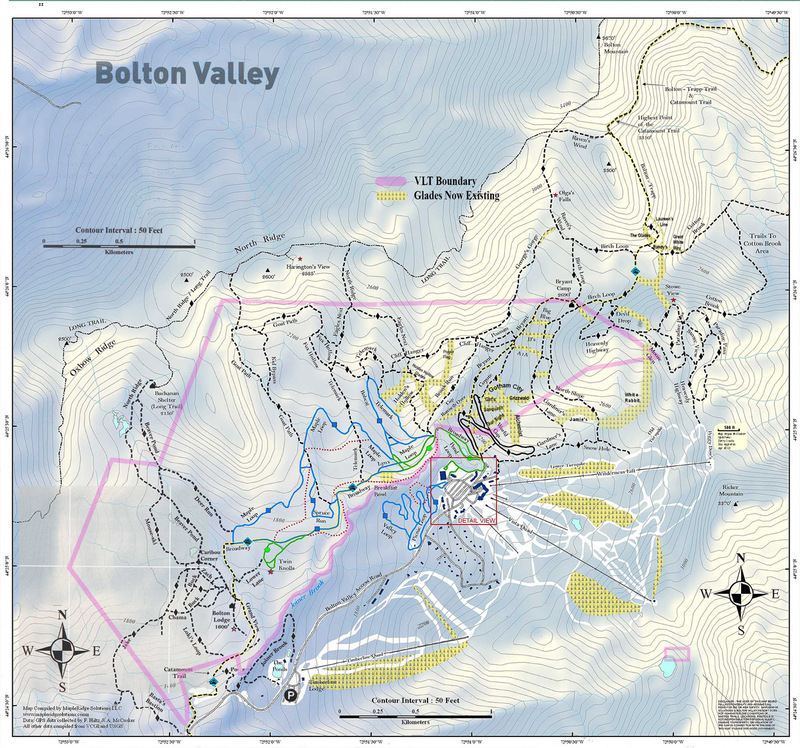 I’d expect someone from Stowe of all places to know that selecting ski width doesn’t work by drawing some arbitrary line down the middle of the country. 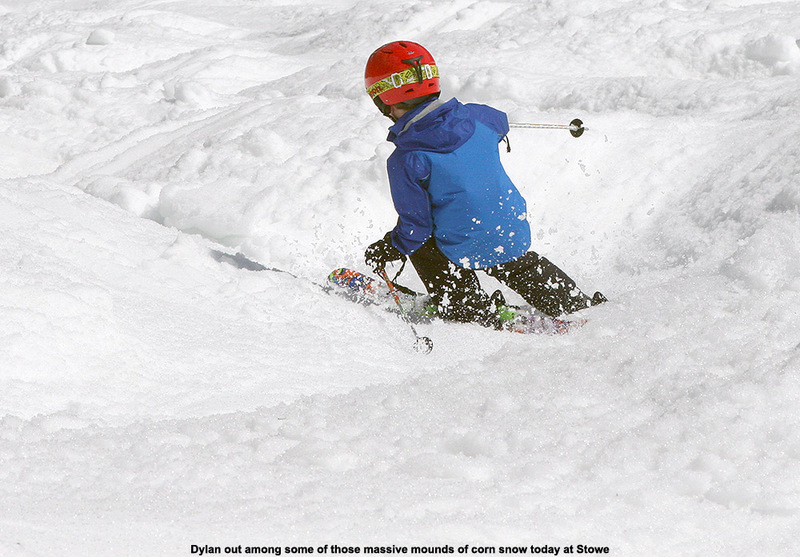 Some of the ski magazines try to preach that sort of approach, and maybe it’s practical for a typical low snowfall resort run on manmade snow in the eastern U.S., but we’re talking about Northern Vermont, where snowfall is as much or more than many resorts in the Rockies. In any event, I was happy that they at least had a pair of the Sin 7s to try, so I got those set and headed for a run with E and the boys. 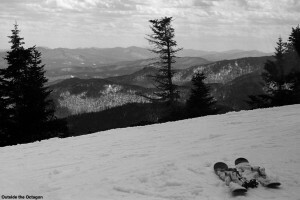 From the top of the Fourrunner Quad, we headed out along Ridge View, and holy cow could those Sin 7s carve! I’m not talking about carving well for a wider ski; I’m talking about carving as well as my Salomon carving skis. I was flabbergasted. Although awesome in powder, I’m fairly unimpressed with the way my 115 mm wide AMPerages carve when they’re out on hard snow. They’re really what I’m used to for skis above the width of my RT-86s in that 80-90 mm range, so that’s what I had to go with in terms of fatter skis’ ability to get out of the powder and onto firmer surfaces. 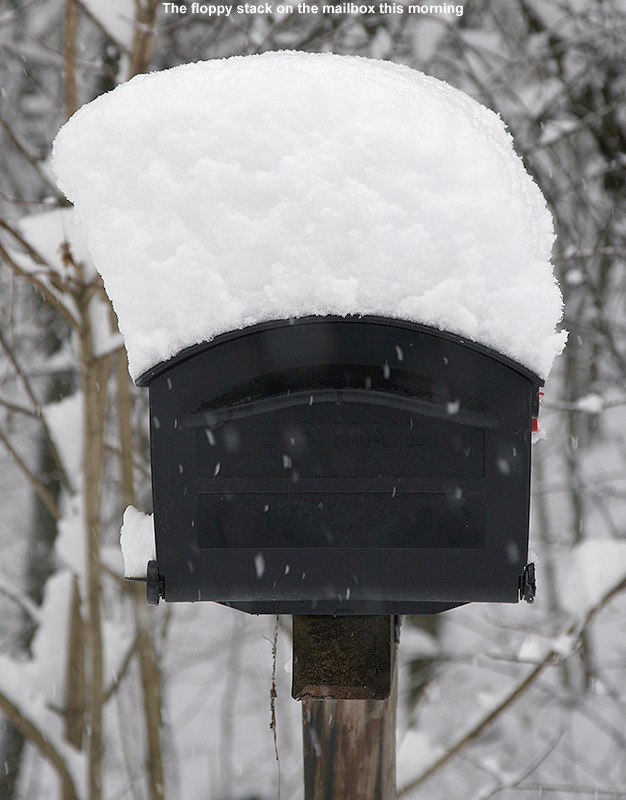 Frankly, as much as I like my AMPerages for powder, even shallower accumulations of powder where their girth keeps you nicely off the subsurface, I can’t even believe that the concept of using them as an all around ski is even brought up – unless your home mountain is Mike Wiegele Helicopter Skiing, or something equivalent, it just doesn’t seem practical based on the harder snow performance I’ve experienced. Granted, the Sin 7 is almost 20 mm narrower at the waist, but it literally felt like you weren’t giving up anything with them on the carving front, at least in the relatively soft corn snow we had today. 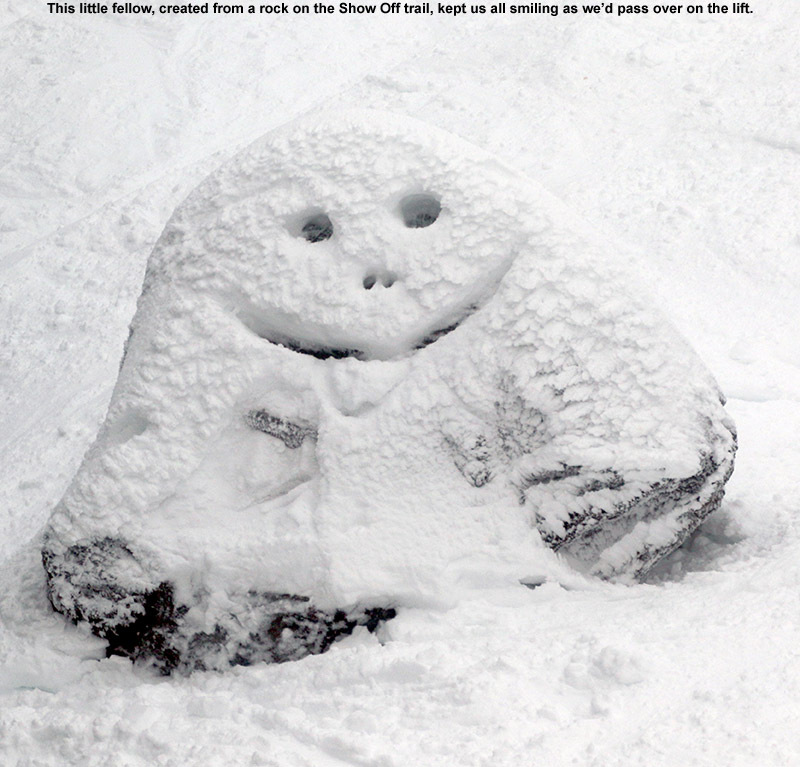 I’m still smiling right now thinking about how much fun it was carving up that snow on the Sin 7. 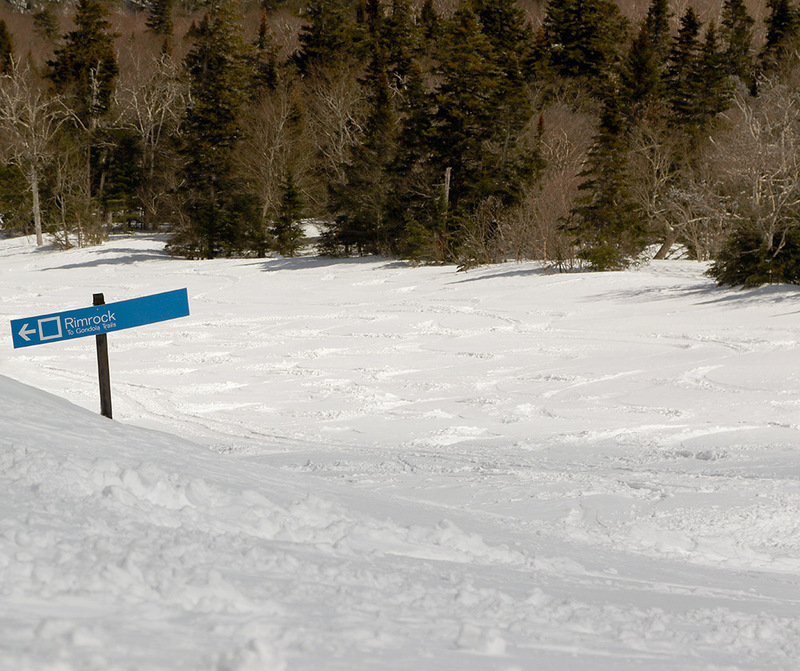 Next up on our run was a trip down Hayride, and they handled it nicely, carving smoothly as needed in the terrain that hadn’t bumped up, or slipping and sliding through the bumps with that soft shovel. In the bumps was where I could tell that I’d be happy to lose the extra length and come down to one of the shorter sizes, but I can only imagine how quick those 164 cm and 172 cm versions must be. On the next run I wanted to try them off piste, so we went through the Bypass Chutes and down into the Nosedive Glades. Even though we were heading off piste, the snow was great, not sticky like it can sometimes be on these spring days; areas that had already received a few turns were definitely the best, but even places without traffic were often decent. It was especially fun introducing E to the Nosedive Bypass area – I’m not sure if we’ve ever brought here out there before. 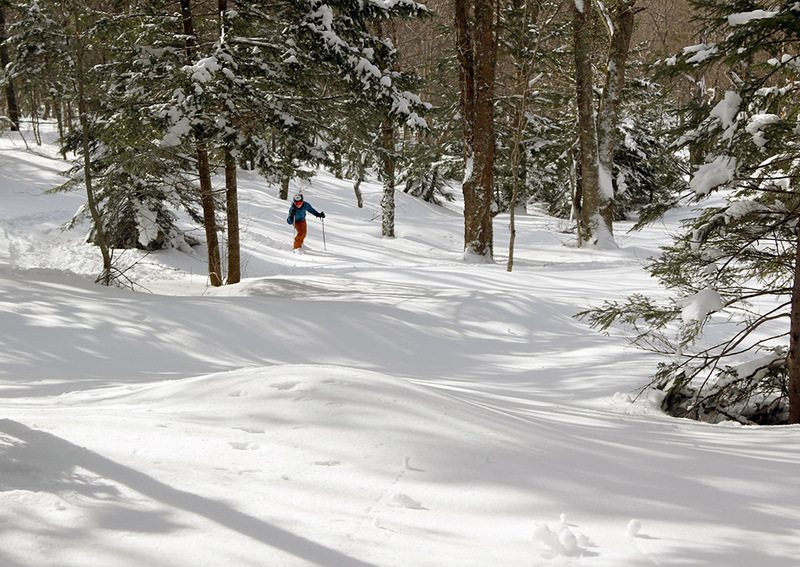 We had a blast exploring the different chute options and routes down in the Nosedive Glades; I knew we’d be back there multiple times during the day. 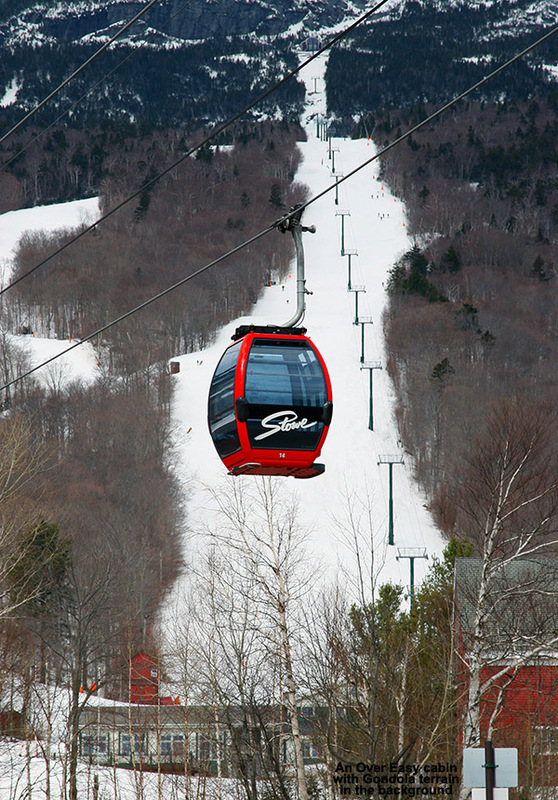 Again, the Sin 7 was a joy to ride, and my only thought was about what they would be like if they were even shorter. People can say all they want about how skis “run” short because of the rocker, and indeed they do, but that rocker is still never going to make a 180 cm ski fit sideways through a gap that is only 170 cm wide. 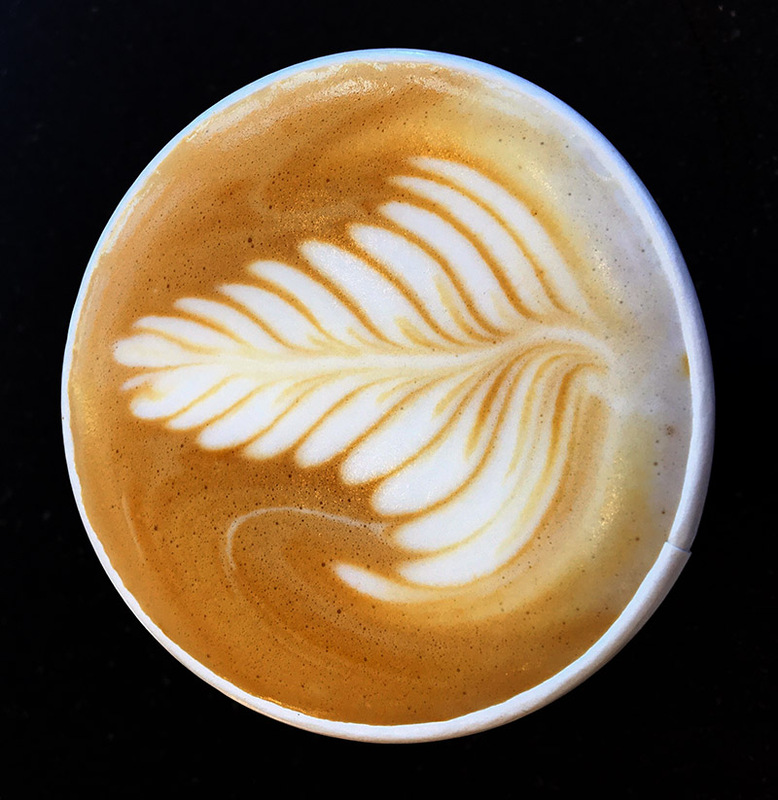 I popped back into the shop, told the guys about my very favorable impressions of the Sin 7, and inquired about what else I could try that would be similar to those. 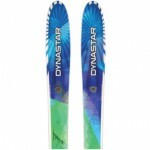 After some hemming and hawing about not having much available in the 170 cm range because that seemed to be what everyone wanted and had purchased, I got the Dynastar Cham 97 (133/97/113) in a 172 cm length. The guy in the demo shop said that he actually liked these better than the Sin 7, so based on our initial interactions, perhaps I should have been suspicious about how they’d appeal to me. I could tell as soon as I clicked my boots into them that they were stiffer than the Sin 7. For some people that might be a plus, but it’s not something I find to be a necessity in my skis, and I’m finding now that if often detracts from their versatility for my purposes. I wasn’t immediately excited by the stiffness, but I still had to see how the Cham 97 was going to behave in action, so we headed up for another run. The boys were anxious for some lunch, and wanted to eat up at the Octagon, so we stopped in there for a midday meal. 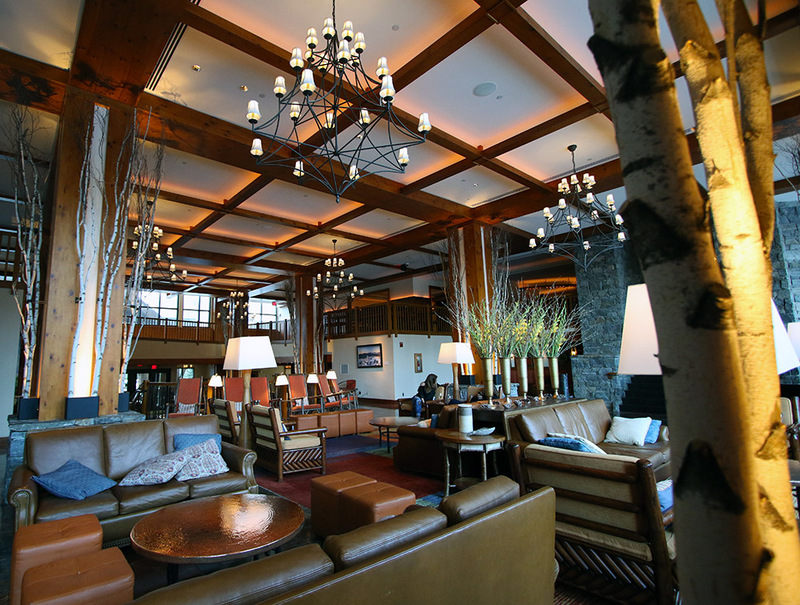 I didn’t think they’d have the selection of food that we’d get down in the main lodge, but they really have some excellent options up there now. I got a nice seared tuna wrap that seemed to have some sort of tzatziki sauce, and it really hit the spot, while E got a turkey wrap with turkey, bacon, apple butter, green apples, arugula, and probably more, but that’s all that she could remember. We order the wraps at the register along with some hot dogs for the boys, and they brought them right over to us at our table once they were prepared. The Octagon was definitely hoppin’ today with the beautiful weather, but we got a nice window seat near the deck and it was a great time. It was little breezy outside at times, but a lot of people chose to sit out there as well. It was sort of strange to have the Cham 97s out there at the ski racks during lunch without even having ridden them yet, but it was nice to be able to jump right on them as soon as we were done eating. We took them on a run through the Bypass Chutes so that I could put them through their paces. 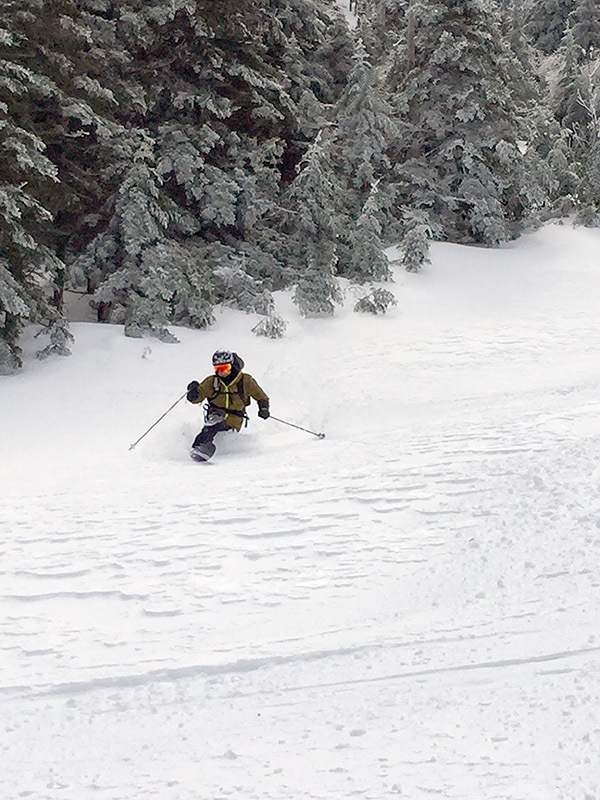 It was nice to drop some length from the Sin 7 as we worked our way through those steep, narrow chutes, so that was a plus. However, even in the shorter length and essentially the same width (dropping to 97 mm vs. the 98 mm on the Sin 7s), the Cham 97s were slower edge to edge and just not as nimble all around. Once we got out onto Nosedive and I did some carving on groomed corn snow, I could certainly see that they carved much better than my more tradition CMH Explosivs which have a similar 95 mm underfoot, but they were nowhere near being on the same snappy level as the Sin 7. One fun aspect of the Cham 97 that was noted by Dylan, was the fact that the shovels of the skis looked like chainsaws, so he was having fun trying to stay away from the fronts of my skis while we were in the tighter confines of some of the Bypass Chutes, lest he get cut in half. One run on the Cham 97s was enough though, because it was simply no contest against the Sin 7, so I popped into the demo shop for my next pair. The third ski I tried was the K2 Annex 98 (131/98/119) in a 170 length – these were lots of fun, and seemed very close to the Sin 7 in terms of what I was looking for. I rode them for two runs, first a run that Dylan requested over toward the Mountain Triple via Ridge View and Sunrise, and then another through the Bypass Chutes. 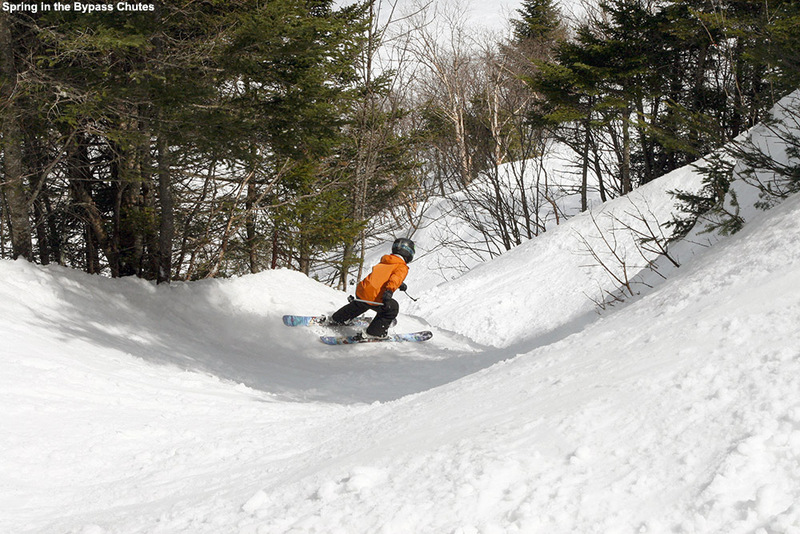 Carving was very reminiscent of the Sin 7, easy and smooth, and they were also fun in the tighter confines of the Bypass Chutes and Nosedive Glades. 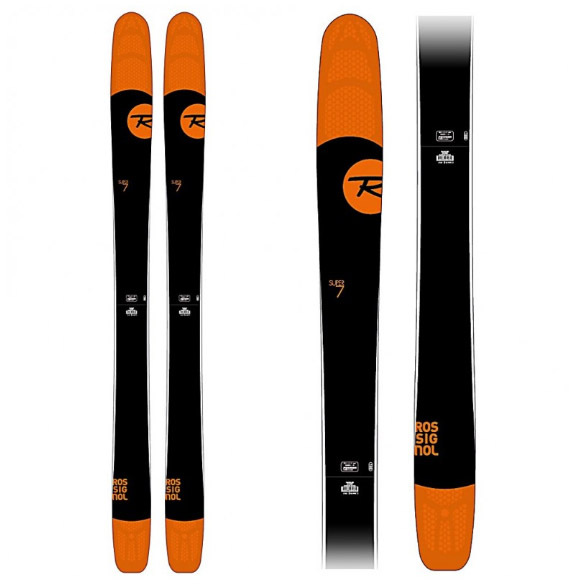 I still gave the personal preference edge to the Sin 7, especially considering that I’d tried it a 180 cm ski, but the K2 Annex 98 was certainly in the running. 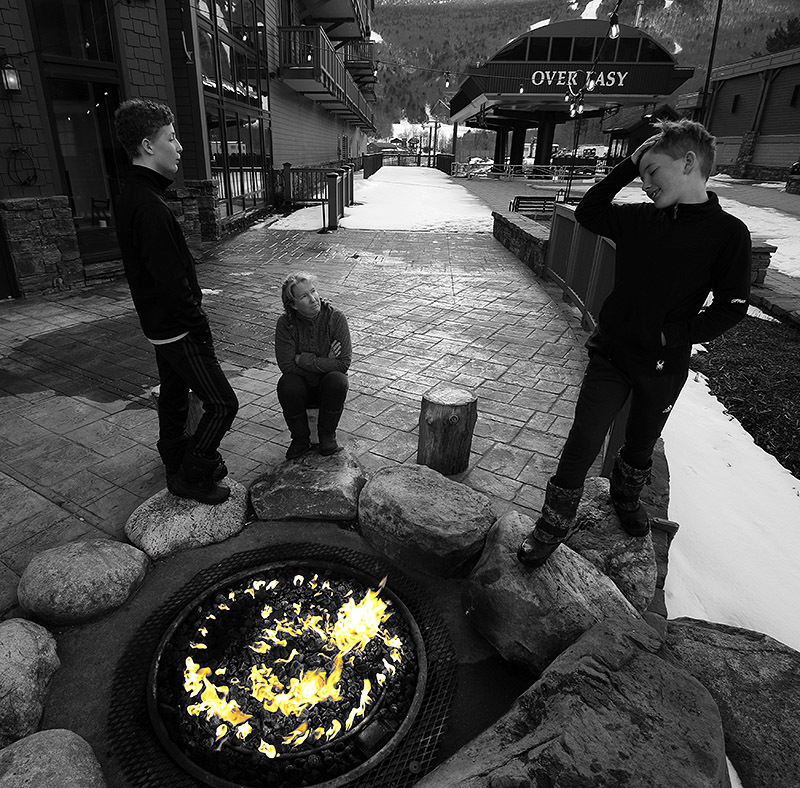 Dylan said that he was starting to feel his legs getting tired after those runs, so he and E decided to hit the lodge, but I had time for a couple more runs, and I wanted to make the most of my ski demo day. 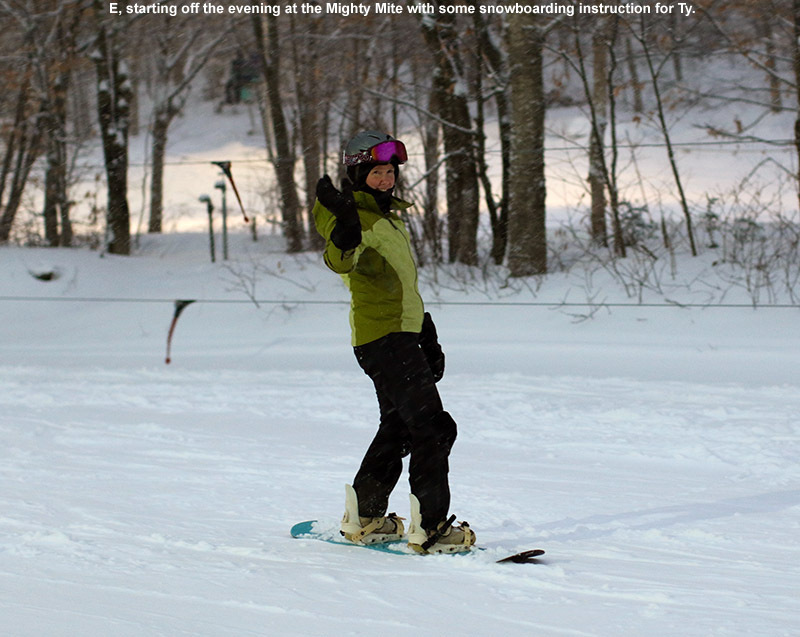 Ty said that his legs were feeling great, so he stuck with me for more turns. 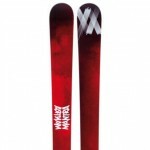 When I inquired about the next ski in the demo shop that time, I let them know that it was OK to go a bit farther afield of the type of ski that I was focused on, and they decided to hook me up with a 170 cm Volkl Mantra (132/98/118). 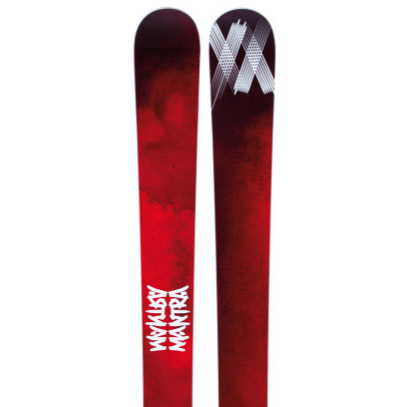 I’ve definitely heard about the Mantra, since it’s been around for years, and the demo guys were saying that this would be one that would require a bit more muscling around relative to the others I’d been skiing. 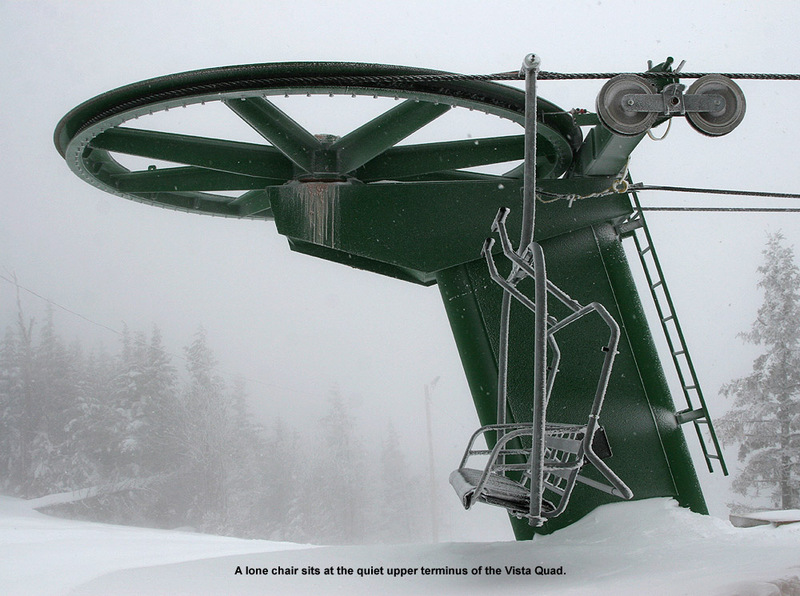 Imagine that, a Volkl ski with stiffness and such – I think we’ve seen that before! I took a run over by the Mountain Triple with a more cruising theme as we’d done before, and just opened up the Mantras. Well, those things just flew! 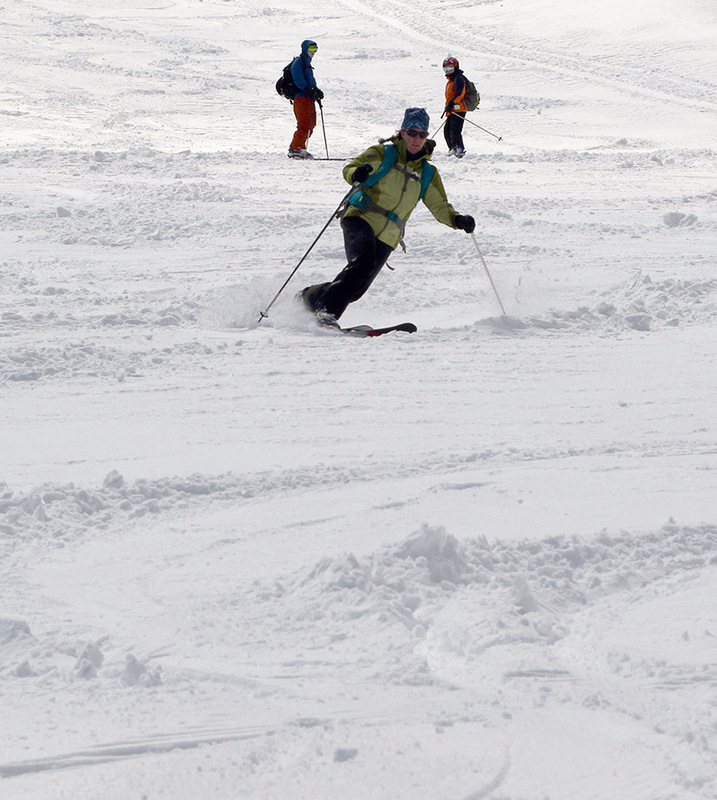 They were an impressively fast, powerful ski. That was a lot of fun, even if I pushed it a bit into the scary zone at times with the high speeds. Fortunately, the trails were getting pretty empty as we approached the end of the day, so it was easy to let it rip from edge to edge on the runs. Ty was happy that I was going Mach 5 down the trails, because he likes to do that sometimes… or more like all the time if we give him the chance. Anyway, those Mantras were a lot of fun, in a stiffer, less forgiving, take charge, longer turn sort of way. I knew going in that they were not what I was looking for in new skis, but they’ll be great if that’s the sort of skiing you like. 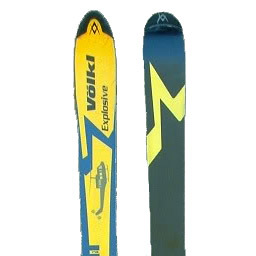 I’d mentioned to the demo guys that I wanted to try something with full rocker, and the ski that they had on hand that I could try was a 170 cm Volkl RTM 81 (126/81/108). 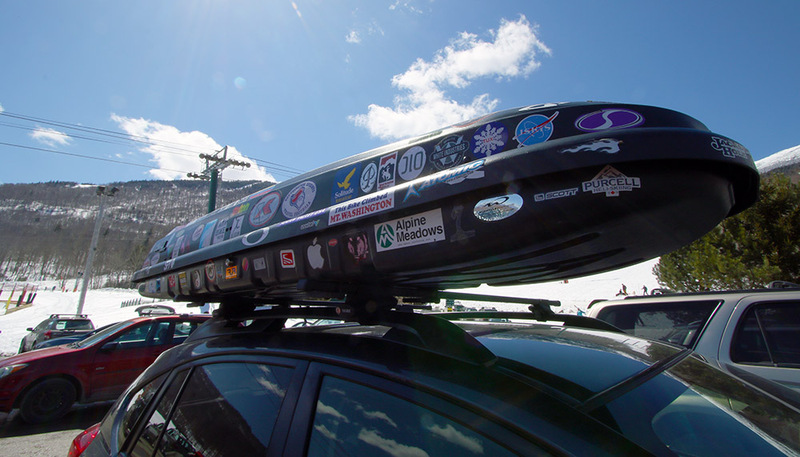 For me, a fully rockered ski with no camber is about smearing turns, drifting, and all that, so it seemed weird to think of it in a Volkl. The RTM 81 also has a narrower, 81 mm waist that what I’d been skiing. 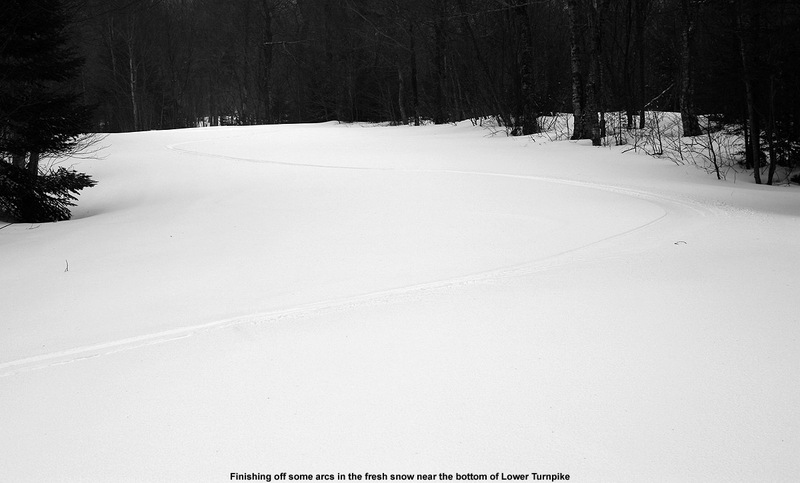 That seems more like a waist for carving, so I was flummoxed as to what the ski was actually meant to do. 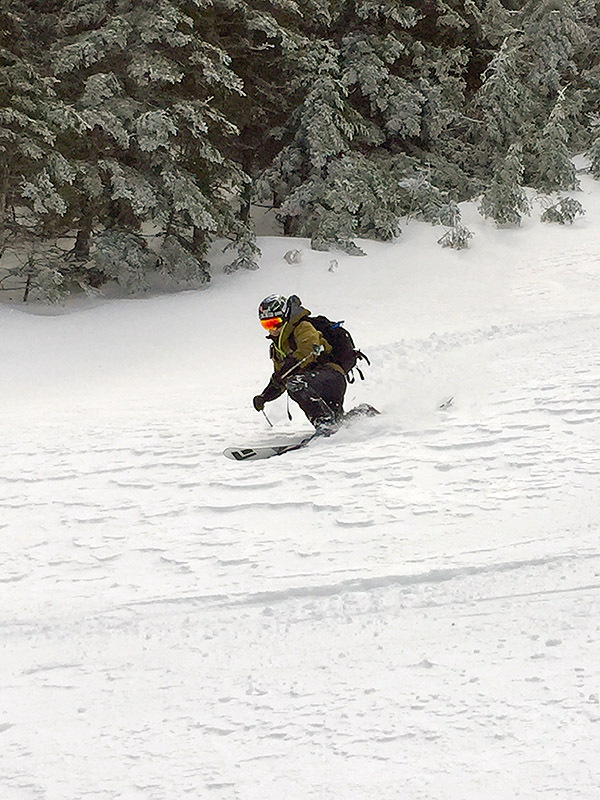 Ty and I took them on a run through the Bypass Chutes and the Nosedive Glades to see if the full rocker would help with drifting and sliding through those tight spaces. It was fine, but it didn’t really seem as though that was what it was meant to do. I want to float on top of the snow if I’m going to be smearing turns and sliding sideways, and in a relative sense, these skis didn’t really have the width to excel at that. 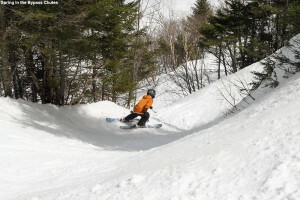 I did find that they were awesomely fun to carve when we got out on Nosedive. Talking with the guy in the demo shop later, I asked him what the target audience was for such a ski, and he said something to the effect of “Oh, only about 50% of the people that walk in here and ski at this mountain.” I couldn’t figure that out – people want a relatively skinny, fully rockered ski – for what? Based on my conversations throughout the day, I certainly didn’t get the impression that the shop guy and the typical clientele he spoke of are out there on rockered boards so that they can smear and drift turns in the soft snow more easily, but I guess you never know. 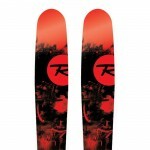 Later, after looking online for some info on the ski, it appears as though the Volkl RTM 81 is more of a front side carver. I guess it was once again that theme of me not really being on the same wavelength as the guy in the shop. I always thought that camber was what one wanted for carving, so I’m not sure why full rocker is put into a carving ski, and a Volkl to boot. 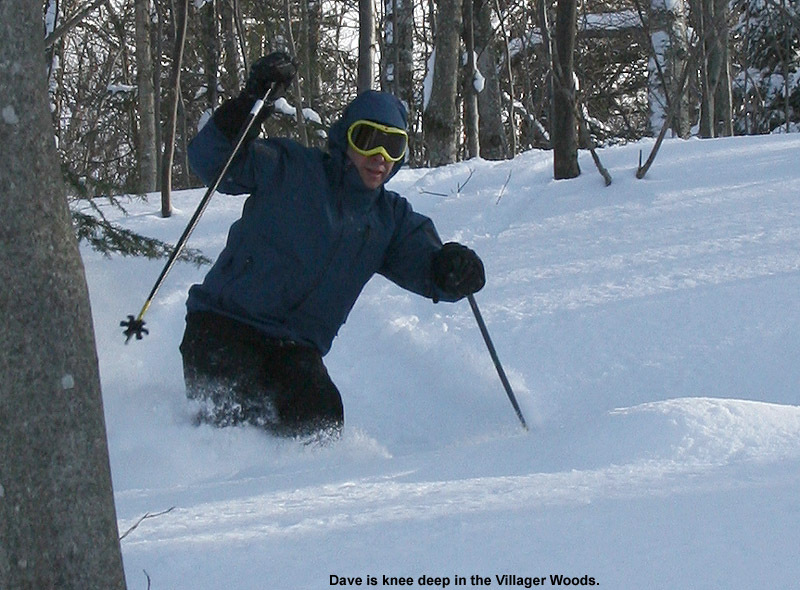 Anyway, they were fun to carve, that sort of ski would be interesting to try in firm conditions to see what they do. At least based on the skis I tried, it was fairly easy to come away from the day with the Sin 7 as the clear front runner for my purposes. 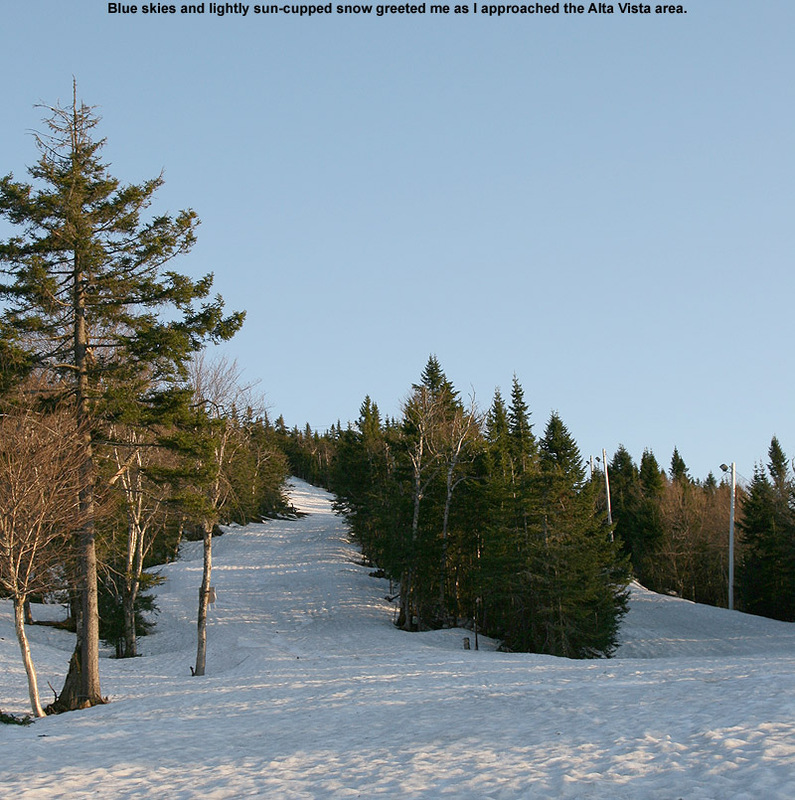 I’m looking for something nimble and flexible that is going to carve tight arcs, fit into tight spaces, and surf on soft snow. The 180 cm length I tried was fine, but I’d definitely go for the 172 cm, or even the 164 cm. Officially I’m in the 172 cm range for my weight, but I’d certainly consider going with the 164 cm, even though everyone says to go longer. I’ve yet to encounter a ski that is too short for what I want, but I can’t say the same for skis that are annoyingly long, and I’m happy to get rid of extra length. I’ve encountered none of the disadvantages that people speak of with regard to shorter skis as my skis have gotten shorter and wider. 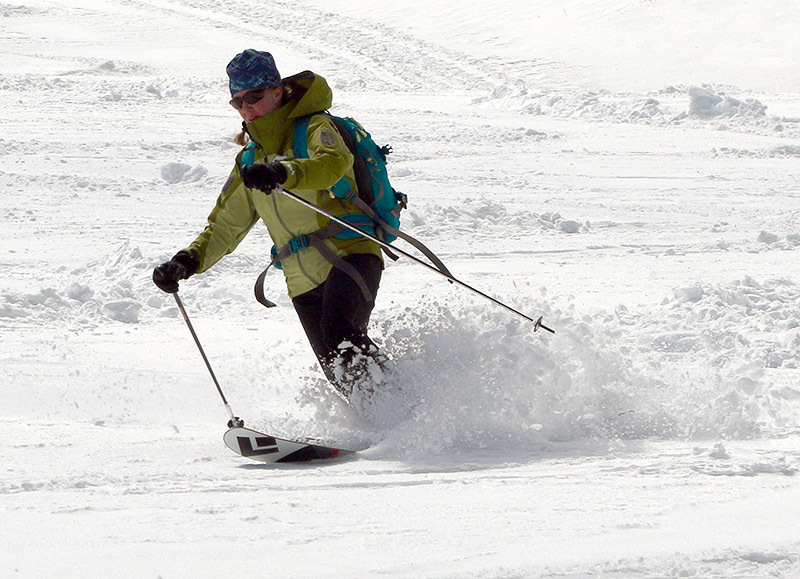 That’s the shape of the tool for the type of skiing we typically do – soft snow, with short-radius turns in smaller spaces. Prior to this outing, I’d only tried out skis on demo days, and the one thing I did learn today was that if you want to try demo skis from a shop while having a full selection of models and sizes available, you should shoot for the first half of the season. 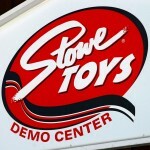 The guy at Stowe Toys said that they actually started selling off their gear in the middle of February. I’m thankful that they had at least one Sin 7 pair left on hand, because that ski really seemed to best hit the sweet spot I was looking for. Unfortunately, I still don’t know what the Soul 7 feels like, but I’m sold enough on the feel and fit of the Sin 7 that I think they would be a fantastic everyday ski for our typical soft conditions, and having another alpine pair of something wider like my AMPerages for bigger days might work. Actually, at almost 100 mm underfoot, I’m sure the Sin 7 would work fine for everything if I was going to try to go with just one pair of alpine skis. 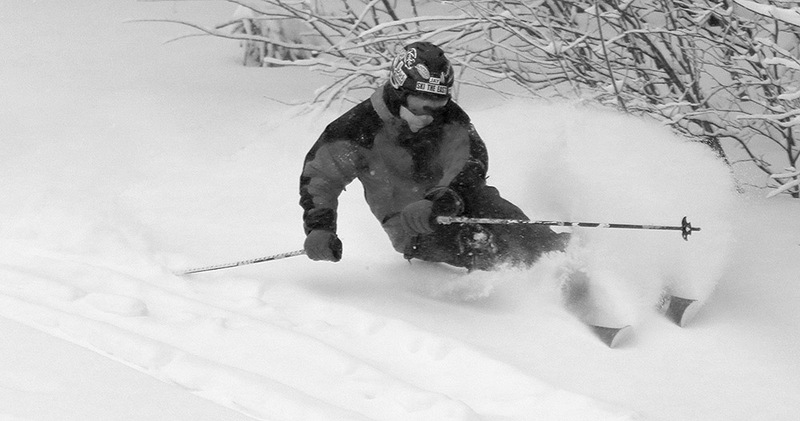 As much fun as fat skis are in powder, they’re far from mandatory. 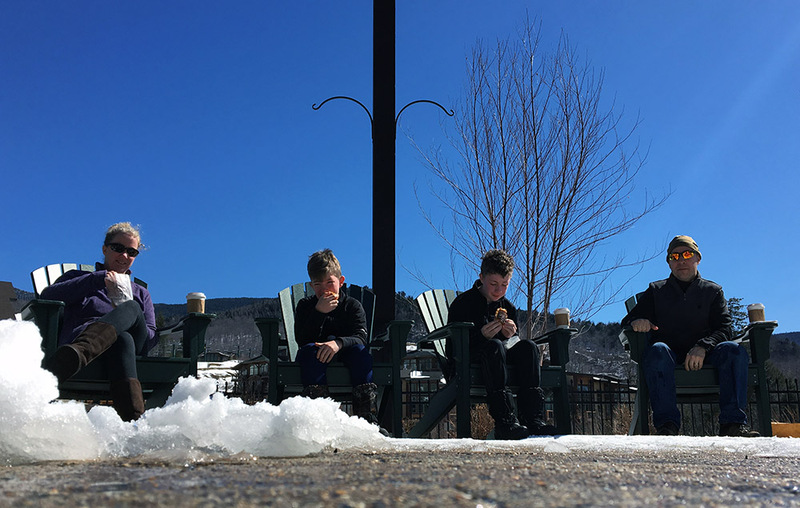 The overall ski experience today was simply great – the snowpack, snow surfaces, temperatures, terrain… it all came together to set up some primo spring skiing. One complaint would be that there were lift queues for the Fourrunner Quad; it was weird to be waiting in a lift queue in mid April, but with great conditions and only a couple of lifts running, I guess that can happen. 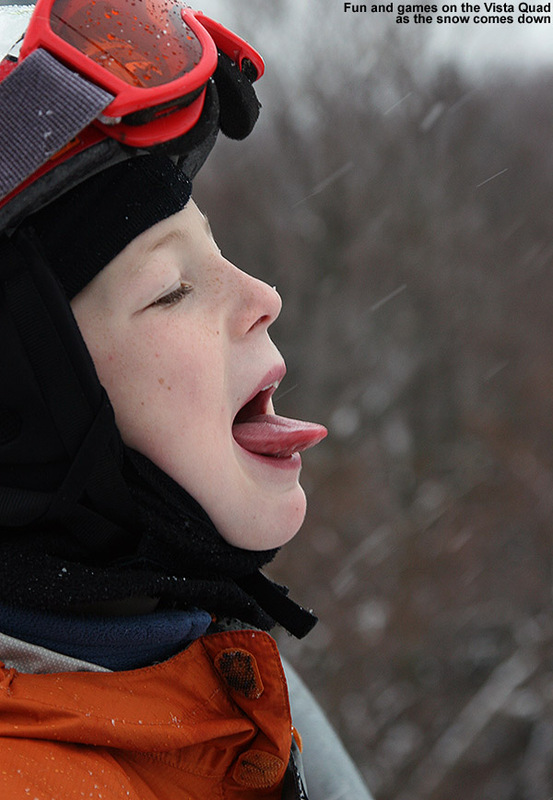 For the boys, it was a chance to ski with both E and I on Mansfield without the time constraints and other obligations that happen on many ski program days. On a number of runs, we used the great bumps on Lower National to work on those technical aspects of turns like timing, pole work, rotation, etc. that moguls really bring out. Dylan showed us some impressive runs through there as he continued to refine his upper and lower body separation, and for Ty, who has always naturally had great technique with his poles, we kept him thinking about it as we’d noticed that he tends to let it laps at times. Although they had their fat skis today for the soft snow, you could really see how the rocker in the skis let them slide right through the moguls with whatever amount of carve or slarve the immediate environment required. We all took turns following each other, and I had a great time on Dylan’s Heels watching him make those little personal choices about which line or angle was the best fit as the run progressed. One of Dylan’s favorite accomplishments of the day was actually up in the Nosedive Glades, where he laid down this beautiful drift of close to 180 degrees around one of the trees. 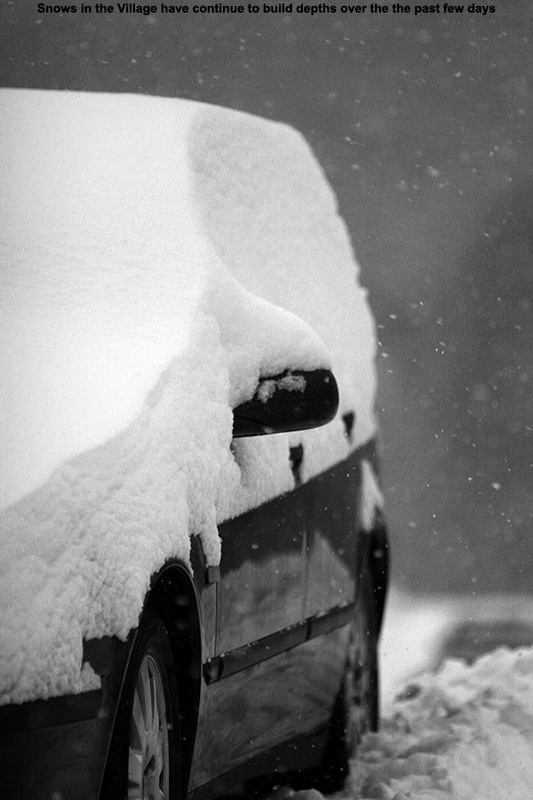 It was one of those spontaneous situations where he came upon the right snow and terrain, and it just happened so smoothly that it was a thing of beauty. 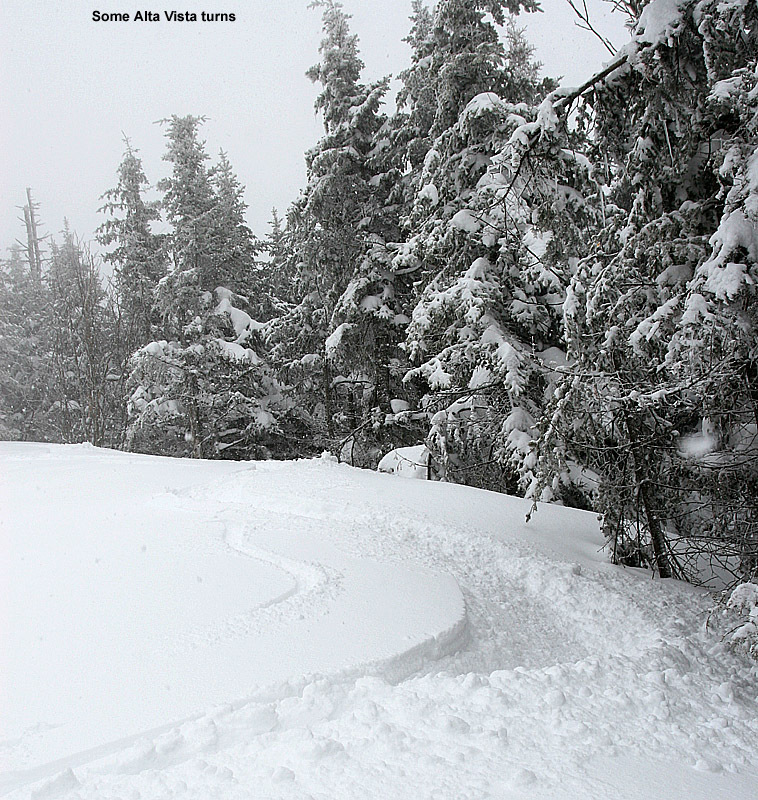 We actually kept looking for that spot on subsequent runs to recreate the drift, but never seemed to quite find it. We could sort of tell though that it was one of those situations where the spontaneity of the first encounter played into the experience, and you can never quite recreate it anyway. It was a great move though, and seeing him do it couldn’t have been more apt on a day when I was trying out all the sets of wider, rockered skis that give one the ability to put those types of moves into action more easily. 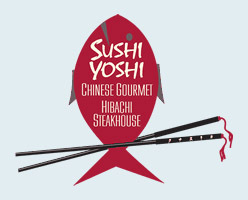 We capped off the afternoon with a trip to Sushi Yoshi, where Ty was able to get his sushi fix, or at least a partial fix, since it’s been hard to find the limit on his consumption. 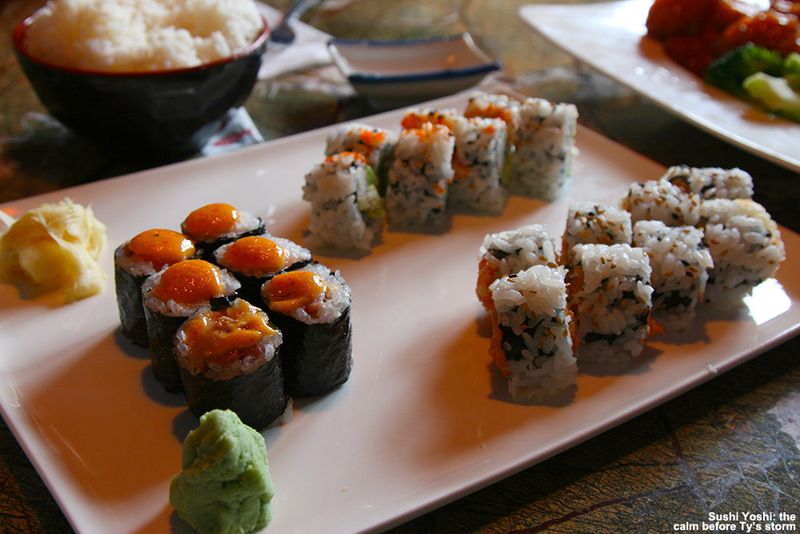 I did get to eat a few pieces without losing my hands to the fray on the sushi board. 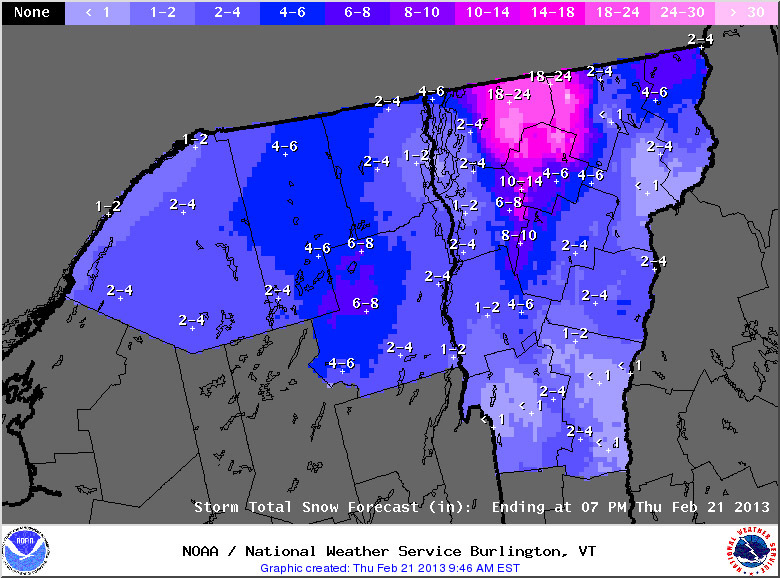 We’re now eyeing the potential for a winter storm around midweek, so we’ll see if we can get some powder infused into this April. E and the boys have the week off, so we may be able to take advantage of the storm with some family skiing if it comes together.